(Nanowerk News) Using arrays of long, thin silicon wires embedded in a polymer substrate, a team of scientists from the California Institute of Technology (Caltech) has created a new type of flexible solar cell that enhances the absorption of sunlight and efficiently converts its photons into electrons. The solar cell does all this using only a fraction of the expensive semiconductor materials required by conventional solar cells. "These solar cells have, for the first time, surpassed the conventional light-trapping limit for absorbing materials," says Harry Atwater, Howard Hughes Professor, professor of applied physics and materials science, and director of Caltech's Resnick Institute, which focuses on sustainability research. 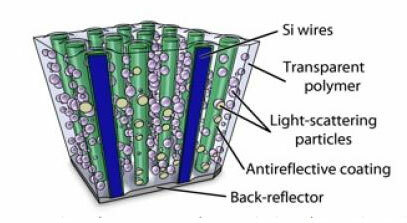 This is a schematic diagram of the light-trapping elements used to optimize absorption within a polymer-embedded silicon wire array. "Light comes into each wire, and a portion is absorbed and another portion scatters. The collective scattering interactions between the wires makes the array very absorbing," he says. Each wire measures between 30 and 100 microns in length and only 1 micron in diameter. "The entire thickness of the array is the length of the wire," notes Atwater. "But in terms of area or volume, just 2 percent of it is silicon, and 98 percent is polymer."